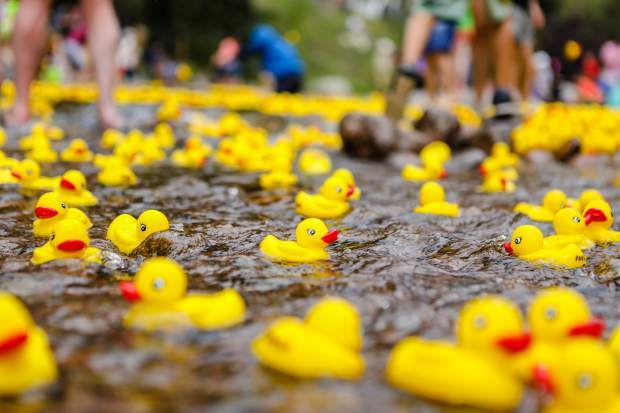 Around 10,000 rubber ducks floated down Gore Creek during the annual Vail Rotary Rubber Duck Race on Sunday, Sept. 2, in Vail. The race went from the Covered Bridge to the International Bridge. The Vail Rotary Club hosted its annual Duck Race on Sunday, Sept. 3, in the heart of Vail Village. More than 10,000 ducks started their way down Gore Creek at the Covered Bridge in Vail and finished their lackadaisical jaunt at the International Bridge. The first duck across the finish line won its adoptive owner $5,000 and a chance to win $1 million.